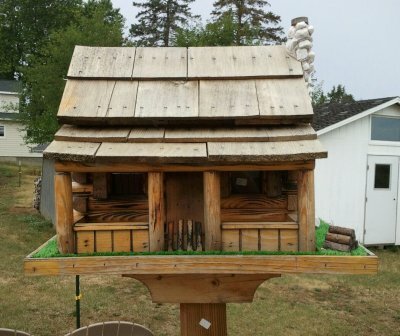 I found this cute little birdhouse for sale at the Lilac Woodshop near Dalton, WI. But is it truly Amish-made? What do you think? Yesterday, my significant other (I’m going to call him my SignifO from now on) and I decided to take a drive through Amish country in the Dalton, WI area. I found a map of Amish businesses online, and we headed off on our adventure with dreams of Amish-made candy, cookies, and quilts dancing in our heads. Anyway, that’s what was dancing in my head. I can’t speak for his head. It was a beautiful overcast day, the occasional splattering of rain interrupted by the occasional beam of sunlight breaking through spotty clouds: perfect driving weather, in my book. Our first stop was at a furniture shop on N County Line Road near Dalton. As it turns out, this and most of the other businesses listed on our map are operated right out of the Amish families’ homes and/or barns. This particular business does not have a showroom at all, so there was really nothing for us to look at. We spoke to the lady of the family for a moment, and she told us the family mainly builds bedroom furniture to order. If we were interested in making a purchase, we would have to speak with the builder and order it. Having recently purchased an Amish-made bedroom set from a local furniture store back home, there was no need for us to bother the builder, so we got back in our car and moved on. 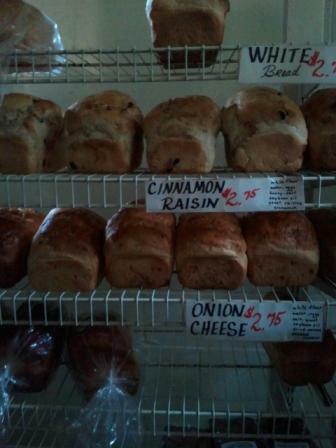 We didn’t find any local, Amish-made goods until we got to the Pleasant View Bakery on Kiefer Rd., near Dalton, WI. We passed a few other businesses on down the road, but they all appeared to operate on the same principle, so we didn’t stop and bother them. After all, the Amish people themselves aren’t to be gawked at as if they are on display. Finally, we came to Mishler’s Country Store, which I had read about online and was excited to see. Unfortunately, this stop proved a huge disappointment as well. I had expected to find a lot of locally-made products; bread, butter, cheese, jelly, etc. What I found were lots of jams, jellies, and other factory-canned and processed items imported from out of state. There were also bags and bags of goods, including factory-wrapped candies (Tootsie-pop, anyone?) that appeared as though someone had possibly purchased in bulk at Sam’s Club and repackaged in homemade packaging to make it appear as though they’d been locally “made.” This didn’t stop the hordes of “English,” as the Amish refer to non-Amish people, from packing the place and filling basket upon basket with goods they could just as easily pick up at their local grocery store. A strange, rotten-produce odor permeated the small country store, so I was happy to get out of there and once again move on down the road. Our next stop was the equally English-packed Lilac Woodshop, which seemed to me offered very little, if any, Amish-made products. But that didn’t stop the Amish-obsessed English from blowing huge wads of money on their furniture. I guess that old saying, “A fool and his money are soon parted” is one maxim that’s fairly simply to prove. One stop that did not disappoint was the Pleasant View Bakery at the end of Kiefer Road. We stood in line for 20 full minutes waiting to make our way into the bakery shop which is housed in an Amish family’s basement. Before we even made our way into the bakery, our senses were assaulted by the smell of fresh breads, pies, and pastries baking inside. Once inside, we grabbed a couple of loaves of fresh, still warm from the oven, Amish bread and a couple of donuts — the best donuts I have ever tasted, I might add! We devoured most of our donuts before we even got back into the car! 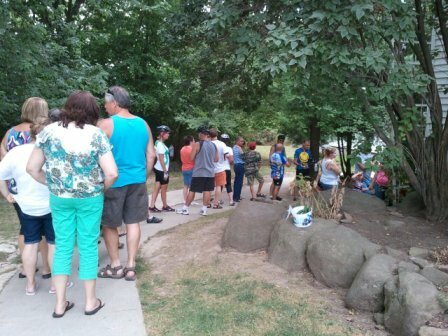 The is the line we had to stand in for 20 minutes before we could get into the Pleasant View Bakery. Those Amish donuts are well worth the wait! Unfortunately, the Pleasant View Bakery ended up being our last stop in Amish country, as we were unable to track down Yoders Candy or the Sunshine Jam Shop listed on our map. It was a great day out, but I was disappointed in how little of the Amish way of life we were able to see. While the local roads were covered in horse manure indicating buggies had been by, we only saw one horse and buggy the entire time we were there. There were very few people working in the fields, and there wasn’t a quilt in sight. I had hoped to get my hands on some kind of Amish handiwork while we were there, but I don’t believe I saw anything (aside from our bakery goods) that was actually Amish-made. And the way the bakery was cranking out the goods, even that made me wonder if the family actually made their goods from scratch or if they had pre-made dough shipped in just like any other bakery might. I’m glad the Amish community is able to earn a living in tourism to supplement their income, but I kind of wish the English wouldn’t prove themselves so easy to exploit. I guess that’s what I get for taking an idealistic view of the Amish. Click here to download the map we followed on our trip through Amish country in the Kingston/Dalton area of Green Lake County, WI. Previous postCan you really potty train a cat? I agree with Janet. You basically act like the Amish were supposed to be there to entertain and amuse you, not to just live their lives or make a living. I can only imagine how you might feel if someone acted the same way towards you.